Editor/Author Kirk, David, Cooke, Carlton and Flintoff, Anne, et.al. 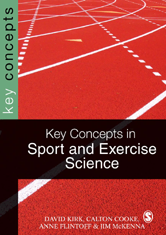 This book seeks to serve as a reader-friendly source of Key Concepts in five of the main areas of study in sport and exercise courses: biomechanics, exercise physiology, pedagogy, psychology and sociology. Understanding these concepts is the starting point for understanding sport and exercise more broadly and will allow students beginning their courses to move on to acquire more specialised knowledge. Serving as a starting point for more advanced study, each entry also offers one or two references for further reading, where each Key Concept is explained in more depth. It will also serve as a useful means of preparing for examinations and other forms of assessment for those undertaking more advanced studies who need to refresh their memories.